The Anne Frank House can only be visited with a ticket bought online for a specific time slot. The same applies to tickets for children (0-9 years old) and visitors with discount cards. The demand often exceeds the number of available tickets. Tickets sell out very fast. 80% of tickets are released exactly two months in advance at noon, 20% on the day itself. Every day at 9:00 am, the tickets for the day are made available on this site. The demand often exceeds the number of available tickets. We advise you to buy your online tickets well ahead of time. 80% of tickets are released exactly two months in advance at noon (Amsterdam time), 20% on the day itself. Every day at 9:00 am, the tickets for the day are made available on this site. Tickets are not sold at the door. You can buy up to 14 online tickets at once. Tickets cannot be exchanged or refunded. The tickets are non-transferable and only valid on the specified date and time. * Please note that you still have to book a ticket online for a specified date and time. Booking charges are € 0.50. 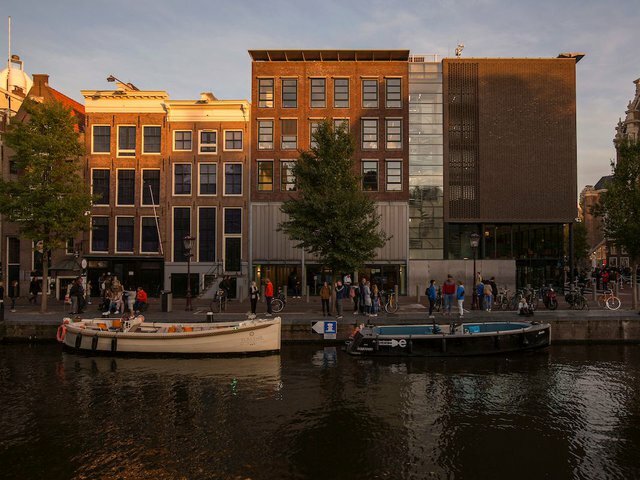 The Anne Frank House is located in the city centre of Amsterdam, at Prinsengracht 263-267. The entrance to the museum is around the corner, at Westermarkt 20. It is a 20-minute walk from Amsterdam Central Station. Alternatively, take tram 13 or 17 and get off at the Westermarkt stop. Book tickets for a regular museum visit, or for a museum visit + introductory program before your visit to the museum. In 30 minutes, we take you through the history of Anne Frank in the context of the Second World War. The program is in English. Book an introductory program for your group before visiting the museum. In 30 minutes, we take you through the history of Anne Frank in the context of the Second World War and the persecution of the Jews. Your group will be well prepared for their visit. The program is in English and includes a museum visit. The Anne Frank House has educational programs for primary schools and secondary schools (for different school types). Read more about the options and add a program to your visit.